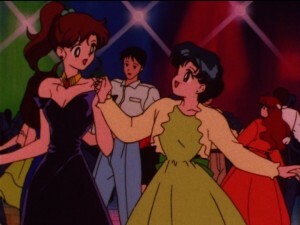 Costumes based on Sailor Moon characters. Two time World champion Russian figure skater Evegnia Medvedeva has given us another great Sailor Moon themed performance! She originally did a Sailor Moon themed routine last year and she’s updated it to reflect many of the events of the first episode of Sailor Moon. This was done this past weekend at the 2017 ISU World Team Trophy in Tokyo. A fitting location for a Sailor Moon themed performance! 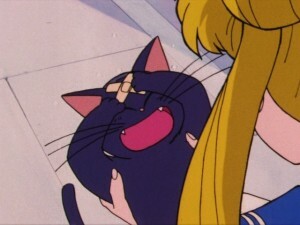 The soundtrack used for her piece includes a number of audio clips from the first episode as Usagi sleeps in, rushes off to school, meets Luna and ultimately transforms into Sailor Moon. As with the last routine it includes the original version of Moonlight Densetsu by DALI. You can watch the full clip below. She did quite well at the competition setting records for Short Program, Free Skate and Total Score. 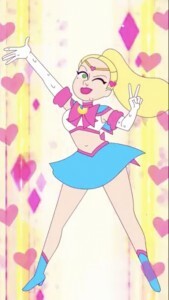 Evegnia Medvedeva is a huge anime and Sailor Moon fan as we continue to see with her fun performances. Every Halloween we see people dressing up as our favourite Sailor Moon characters to celebrate and this year was no different. This included Rowan Blanchard, who plays Riley Matthews in the Girl Meets World TV series. 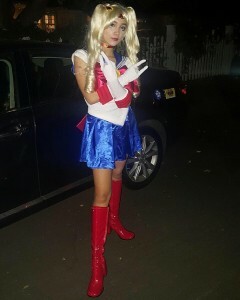 She dressed up as Sailor Moon last week! Her costume included makeup to make it look like she had massive anime eyes. A photo of her in costume was posted to her Instagram account along with some lyrics from the English Sailor Moon theme song. I know I’m a bit late to be posting about Halloween but I don’t exactly have my finger on the pulse of every Disney Channel series out there. If you’re on Instagram don’t forget to follow the sailormoonnews account. 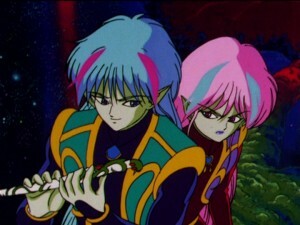 Did any of you dress up as Sailor Moon characters for Halloween? Let us know in the comments! 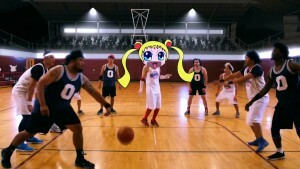 Jeremy Lin faces off against Sailor Moon in Space Jam 3: Anime Edition! The sequel to the sequel to Space Jam is out and it features Sailor Moon! This fan film by Ryan Higa stars Jeremy Lin of the NBA basketball team the Brooklyn Nets. Amongst the anime stars are Goku, Naruto, Yu-Gi-Oh and of course Sailor Moon. As with the original Space Jam the story has animated characters, this time from anime, recruiting a professional basketball player to help them. 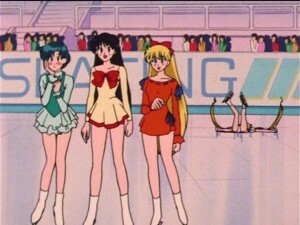 Sailor Moon plays on the AnimeNiacs team, which is the latest incarnation of the Tune Squad. Watch the full video on YouTube embedded below. 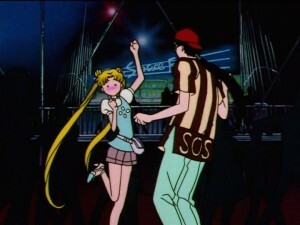 The first Saturday in August fans from across the world get together in their own cities for small Sailor Moon get togethers. It’s August and tomorrow is Saturday so as you might have guessed Saturday August 6th is International Sailor Moon Day. Check out the International Sailor Moon Day web site to see if your city is involved! Will any of you be attending events in your city? Russian World Champion figure skater Evgenia Medvedeva is a huge Sailor Moon fan. 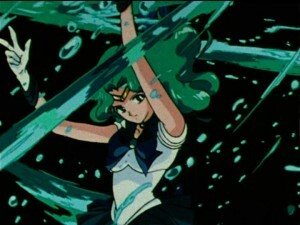 She shows us this by performing a Sailor Moon inspired skating routing in costume to the music of Moonlight Densetsu, the opening theme of the original Sailor Moon anime. 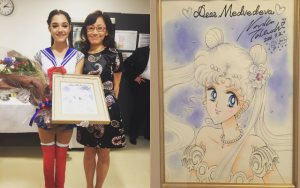 Naoko Takeuchi, the creator of Sailor Moon, was so impressed by this routine that she met with Evgenia Medvedeva after a recent performance and gave her a signed Sailor Moon sketch. Watch a video which features some clips of that performance below. To see just how much of an anime fan Evgenia really is check out her Instagram and Twitter feeds. It’s nice to see younger fans who weren’t around when the original Sailor Moon anime was out who are still getting into this great series.